1. In a heavy bottomed saucepan, heat the milk, salt and 1/4 cup sugar over med-low heat until steaming but not boiling and the sugar is dissolved. 2. Add the vanilla bean and vanilla bean caviar to the mixture. Cover and let steep for 1 hour. 3. In a small saute pan, melt the butter, brown sugar and salt. Bring to a boil stirring constantly until the mixture turns a deep golden brown. 4. Add the bananas and continue to saute the mixture for approximately 5 more minutes or until the bananas soften. Stir in the rum and remove from heat. 5. Let the mixture cool to room temperature. 6. Fill a large bowl with ice and water. Place a small bowl in the ice water and add the heavy cream. Top the small bowl with a wire strainer and set aside. 7. In a small bowl, whisk together the egg yolks and remaining 1/4 cup sugar until light in color and ribbons begin to form. 8. Reheat the milk mixture over med-low heat and slowly add to egg mixture whisking constantly so the eggs do not scramble. 9. Stir constantly with a heat resistant spatula being sure to scrape the sides and bottom until it begins to thicken (it will coat the back of the spatula). 10. Strain the milk mixture into the cream, remove the strainer and stir until combined. Cover with plastic wrap and chill in the refrigerator for 2 hours or overnight. 11. Pour the mixture into the freezer can of an electric ice cream maker and freeze according to the manufacturer’s instructions. When the mixture reaches soft serve consistency, add the banana mixture and continue churning until combined. 12. 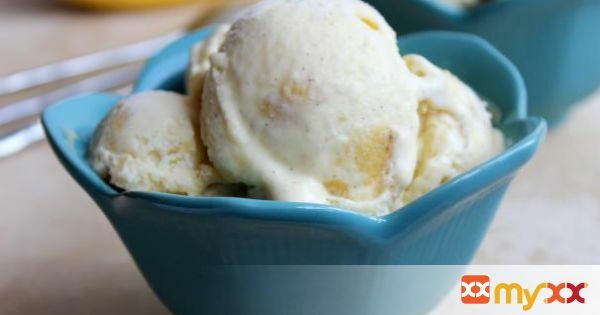 Transfer the ice cream to a freezer safe container and freeze.